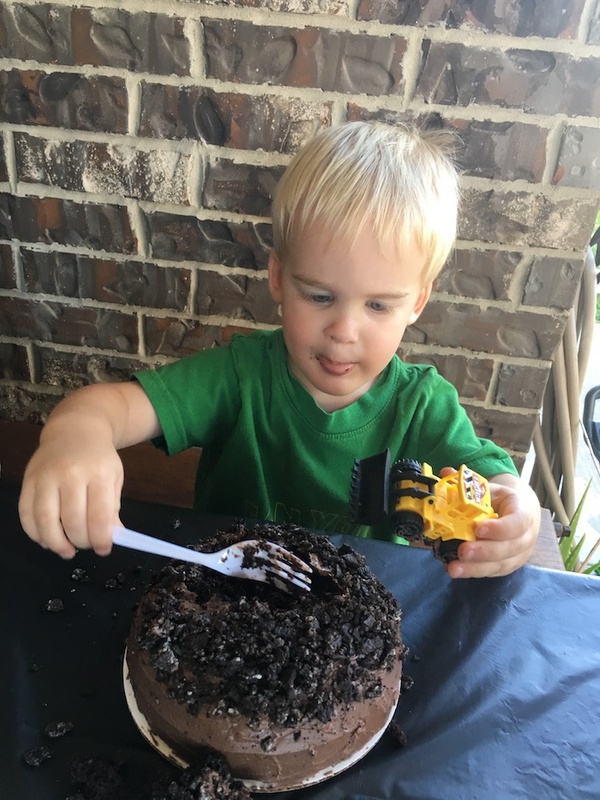 Dirt cupcakes made from chocolate cake, chocolate frosting, and crushed oreos were perfect for my son's construction truck themed birthday. Now that I have been properly educated, it was time to get to work on a birthday party for my little one. We made a bunch of decorations for it, and I was trying to decide what to do for his cake. I started searching ideas and kept finding dirt cups, but those are usually made with pudding and I didn’t want that mess with a bunch of two- and four-year-olds. So I decided to try to make them into cupcakes, and they came out delicious! Usually, I would make my homemade chocolate cake recipe, but for the party I was running out of time. I needed something a little quicker, so went with a boxed cake mix. But next time, I will plan better and make my own cake batter. The kids all got a blast out of these cupcakes and the small cake I made just for Ryan. They thought it was really funny to have worms on their cake! And luckily, since the boys were so into construction trucks, we had a lot of big and little ones laying around. The small ones were perfect to put on the cake. If you are using a box cake, bake it as directed for cupcakes. I used our small 6″ cake pan to make Ryan his own cake, then used the rest to make cupcakes. Once the cakes have cooled completely, frost them with chocolate frosting. Use a rolling pin or meat tenderizer (my favorite for this) to crush the cookies. We used oreos since I had some on hand, but you can use any chocolate cookie. Sprinkle the cupcakes with the crushed cookies to resemble the loose dirt. Top each cupcake with a gummy worm. I used some of the extra crushed cookies to put around the tray, too, for added dirt effect. Dirt cupcakes made from chocolate cake, chocolate frosting, and crushed oreos were perfect for my son’s construction truck themed birthday. Great party idea. Very creative and I think every kid loves chocolate! They were perfect for the age of the kids because they each got their own little one to enjoy! That is a really cool idea. Especially, for. the boys. Everyone loves chocolate and the worms add more colors and feel of the dirt. The worms were a last-minute decision but the kids all loved them! I absolutely love these! My cousin did a “Bob the Builder” (construction/dirt-themed) birthday sheet cake for one of her boys when he was little, and I remember thinking how fun and cute it was. 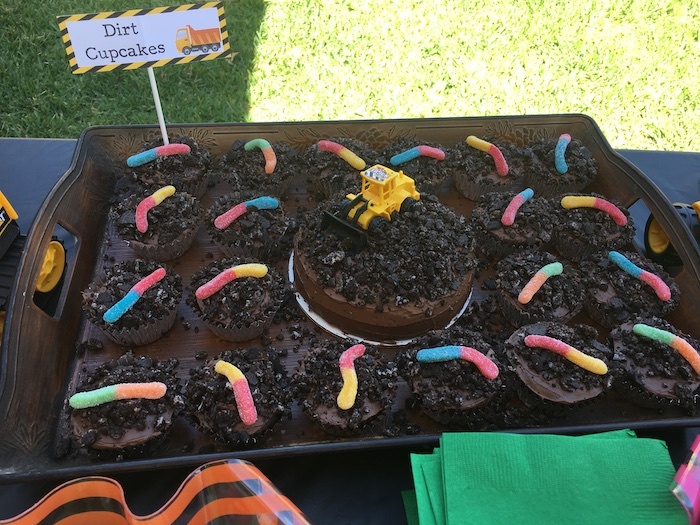 But I really like the portion control and relative lack-of-mess of cupcakes for a birthday party, so these are just genius (and I agree, the worms are def the perfect finishing touch – kids LOVE Gummi anything!). My son loved Bob the Builder at this time, but he said he didn’t want a “Bob party” but wanted construction trucks still. So, it’s what we went with! This is the same kid who had a “banana party” and is already talking about having a “red party” this year! The worms definitely made it more fun for the kids! These would be so very fun! My kids love gummy worms so these would be perfect.